So let’s talk about these oatmeal squares. Anyway, so the original iteration of these oatmeal squares contained just rolled oats, honey, and peanut butter. I usually add ground flaxseed and then dump in some chocolate chips for fun. I’ve also tried them with dried cranberries. They’re pretty versatile and forgiving. I like these because I can make a batch on Sunday and then have enough to last a little over a week. I just grab one of these in the morning to snack on after the baby wakes up and I’m good to go. But you know, you can just be normal and make these as a nice alternative to granola bars instead! Omit the ground flaxseed or keep it in — these bars contain natural ingredients and are fairly healthy unless you go crazy with the fun add-ins. For this month’s Stonyfield Clean Plate Club challenge, we got to pair Stonyfield Organic yogurt with Divine Chocolate for a Valentine’s Day inspired recipe. 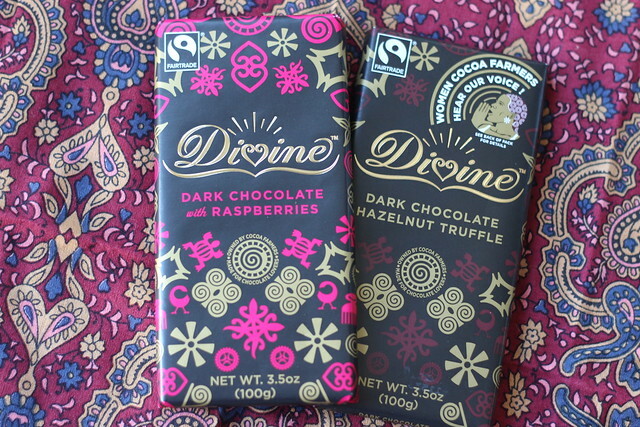 (I love the story behind Divine Chocolate, which you can read here.) Usually for Valentine’s Day I make chocolate-covered strawberries for Mr. Spice and me, but this year I thought that I would dress up my plain Jane oatmeal squares into something a little more special for Valentine’s Day, incorporating the taste of dark chocolate and berries. Instead of using peanut butter, I used almond butter, added some dark cocoa powder, chopped up a bar of Divine Chocolate 70% dark chocolate with raspberries and made a glaze using Greek yogurt, confectioner’s sugar and berry jam. Fancy! I liked the balance between the almond butter, dark chocolate, and the glaze. 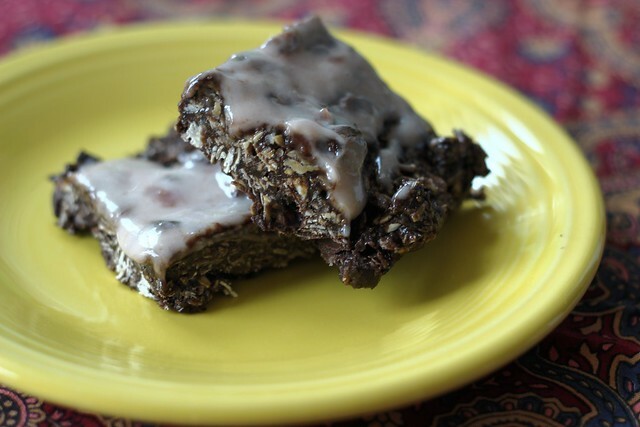 Almond butter to me isn’t very sweet, and dark chocolate has a nice bitterness to it, so the berry yogurt glaze gives the oatmeal squares that little boost of sweetness that you need without it being too overpowering. *Disclosure: Stonyfield Organic provided me with coupons for their yogurt and compensated me for this post as part of their Clean Plate Club. Divine Chocolate provided me with coupons for their chocolate as part of this month’s campaign. All opinions are my own. Heat nut butter in a large mixing bowl in microwave for approximately 30 seconds, to soften. Add honey, ground flaxseed if using, and cocoa powder and stir to combine. Add rolled oats and chopped chocolate, mixing all ingredients thoroughly. Line an 8 x 8 pan with parchment paper, then carefully spread mixture evenly in pan. Cover with plastic cling wrap and refrigerate until slightly firm. In a bowl, combine the Greek yogurt and confectioner’s sugar until the sugar is incorporated into the yogurt. Add berry jam as desired to your taste. Drizzle or spread the glaze over the oatmeal squares and refrigerate until firm. Carefully cut into 9 squares. Store in fridge. Healthy stuff for those with sweet tooth and chocaholics!